It is a curious thing this bully, as it is called; very curious to those who have never seen a game at football before, and who cannot imagine why the boys should all be so heaped together. Each side forms down opposite to the other. In the centre of our side stood Barry, a big heavy fellow, who filled the place of post, as it is called, and was a sort of centre point round whom the rest clustered. On each side of him were two supporters, and behind these three two more backing up. The rest of our eleven were dispersed at the corners or behind. The opposite side followed the same arrangement, for, indeed, it is the regular one for an Eton game. There were thus ten of us in the middle of the field, and when the ball was placed in the centre of this group, and each side bent down over it, striving to force it beyond their opponents, the whole ten seemed to form one solid mass, which to the spectators, who could see nothing of what was going on on the ground, miglit seem heaving and struggling in the most senseless manner, did they not know that the secret of the contest lay at the bottom, and might at any moment by a sudden movement be brought out before their eyes into the open field. [pp. 116-17] . . . The game at the wall which was to be played to-day was as different to what we were accustomed in the field as any two games at football could be. In the field we had a whole extent of meadow before us, pretty nearly as broad as it was long; but at the wall there was but a narrow strip, scarcely fifteen yards in width, and this too ran straight along the wall which divided the playing fields from the Slough road, and gave its name to the game we were about to look on at. 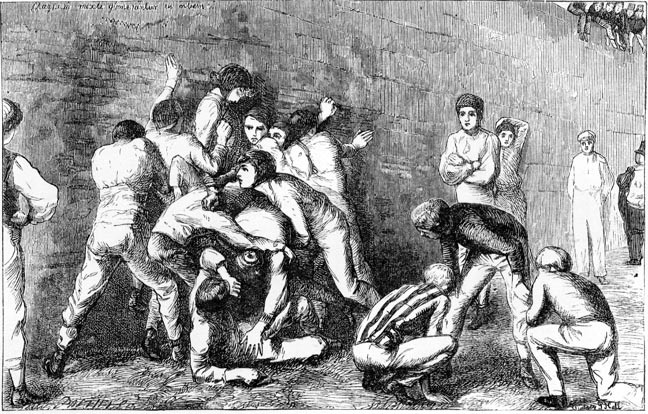 The consequence was, that the bully at first starting could not poaaibly take place in open ground, but had to be formed up against the wall; and then, as there was a constant dread that every kick might send the ball out — that is to say, beyond the line marked as the limit within which they were to play — the game became a constant melée. in which small kicks and skins predomonated rather that s regular display of speed and science such as could be seen and appreciated in theordinary field matches. . . . The ball itself was, of course, totally invisible to the line of spectators; one could only guess at its whereabouts by the direction of the fierce kicks which some of those standing outside lavished on their prostrate enemies. No mercy indeed was shown by one side to the other; the old antagonism between Tugs Collegers] and Oppidans was too deeply rooted in the hearts of each party to let them forego this opportunity of paying off any little debts of hatred ; and those in each eleven who happened to be lower clown in the school, and who had not yet learned to appreciate the social qualities of their adversaries, fully kept up the character for ferocity which the annual contest had obtained. At last the ball emerged from the living heap which had covered it. A rush was at once made upon it by those outside, but after a short interchange of kicks it was driven beyond the boundary, and the bully had again to be reformed a little lower and towards the Colleger's end. An Etonian [Charles Frederick, d. 1892]. Recollections of Eton. London: Chapman and Hall, 1870.